Dagg hit the rugby headlines in 2006 when as an 18-year-old he became the first secondary school player to be selected for Hawke's Bay since his team-mate, former All Blacks halfback Danny Lee, first played for the province in 1994. An NZ Schools, Under-19s and Sevens international, he rose to prominence for the Magpies before making his Super Rugby bow with the Highlanders in 2009. He continued to catch the eye and having been pinpointed for his potential 18 months before, he was rewarded with a call-up to the All Blacks in 2010 and made his debut against Ireland in New Plymouth. His first Test try came against South Africa as a replacement weeks later and was a stunning solo effort, earning Dagg huge praise and comparisons with All Black great Christian Cullen. Another followed before the end of the tournament and proved even more vital, sealing victory over the Springboks in Soweto and with it the title. 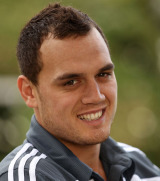 Dagg's hopes of influencing New Zealand's squad for the Rugby World Cup were hampered by a series of quadriceps injuries, the first ending his hopes of joining their Grand Slam tour in 2010 and the second ruling him out for the latter part of the inaugural Super Rugby season - where he had starred for the Crusaders. However, Dagg earned a recall to the All Blacks side to face South Africa in Port Elizabeth and clearly did enough to impress coach Graham Henry - despite the Kiwis losing the match - as he was later named in the 30-man squad for the World Cup. Dagg was spotted drinking and smoking in an Auckland bar, along with winger Cory Jane, just 72 hours before the All Blacks' quarter-final match against Argentina. But that incident did not tarnish what was a hugely successful tournament for Dagg. He not only secured the fullback spot, but scored five tries and was one of the players of the competition as the All Blacks won the World Cup.